We like the Interphone family of comms. systems. They work well, are easy to operate and can be made to fit just about every kind of helmet. They’re excellent value too. Being able to unclip the control unit so that you can carry it in your pocket is also useful. Until now, there were three models in the range: The Sport, the Tour and the entry-level Urban model. Well Interphone has now replaced the Urban with an improved model that is called the Link. It’s got most of the functionality of the higher spec’d units. It has the ability to talk to all other comms. systems. It will Bluetooth to the phone or sat nav, it has a radio, can be controlled via an app., and so on. The big differences with the new model are that it now has a 15 hour battery life and a range of 300 metres, as opposed to 100 meters. Designed specifically for rider to pillion communications, it’s good to know that it now has a pretty decent rider to rider capability too. We first saw the Phoenix helmet last November at the international motorcycle trade fair in Milan. It made quite an impression on us. Partly because of its looks, but also because of the ability to customise it. All the trim pieces, including the entire chin section, can be changed to create a helmet that looks very different to the base model. These pieces are not all available yet, but they’ll be coming through soon. Made from carbon, the Qwart weighs in at just 1,190 grammes. It’s got to be said that it’s unlikely to be anybody’s first and only helmet. It’s more about Sunday mornings and special occasions commuting or touring. You can expect it to be a bit noisy, and without a high-tech rubber seal around the visor, it probably won’t perform too well in heavy rain. But nobody can deny that it’s a funky looking helmet. 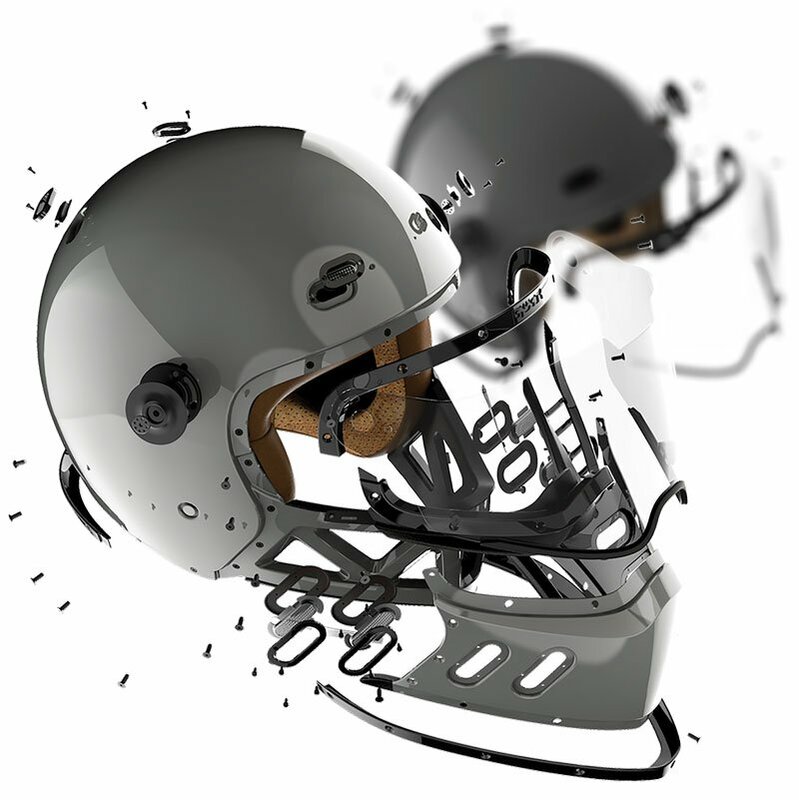 Beneath the chin piece, there’s a trellis frame that gives the front end of the helmet its strength. Now the helmet is not certified to be worn without the front panel in place, but clearly some people will wear it like this anyway for an airier feel. At £600+, the Phoenix is not cheap, but is is a truly original and different design. Clearly the folk at Qwart think it could be the helmet that replaces the Ruby. There is one important issue with the Phoenix, however, and that is the fit. It won’t work on everybody. We’ve already found that some people need to go up a size. 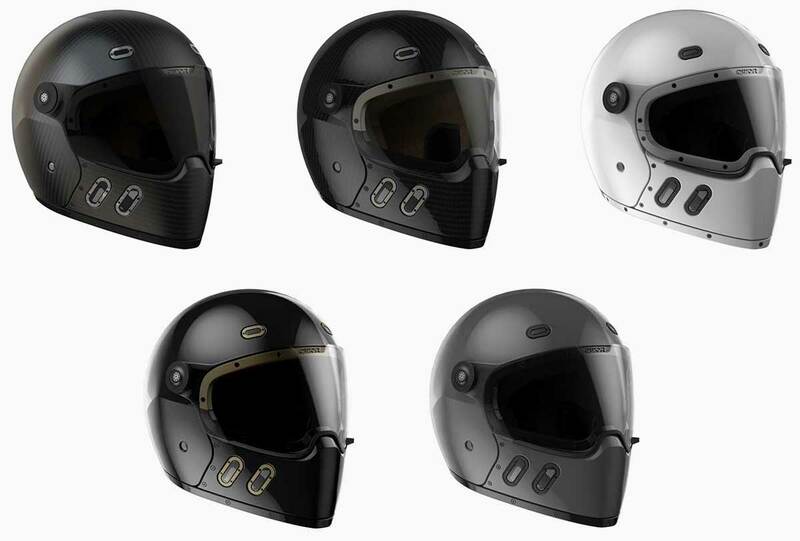 If you’re interested in the helmet, your best course of action would be to visit us in Guildford to try it on. We’ve got all the sizes, although some colours have not yet turned up. Well okay, if we’re being a stickler for accuracy, we’re not actually giving comms. systems away. But at the prices we’re going to be doing them for, it certainly feels like it. First thing we should say is that this isn’t a Motolegends offer; this comes straight from the manufacturer, and we suspect it’s their way of hitting back at Shoei. Anyway, to get the cheap comms., you have to buy a new C3 Pro, E1 or C4. If you buy a C3 Pro or E1, you will get the SC10U comms unit, which normally sells for £240, for just £75. That’s a whopping saving of £165. If you buy any C4, you can get the ‘standard’ SC1 comms. unit, which normally sells for £200, for just £50; thus saving £150. Before you ask, the answer is no, you cannot get the comms. 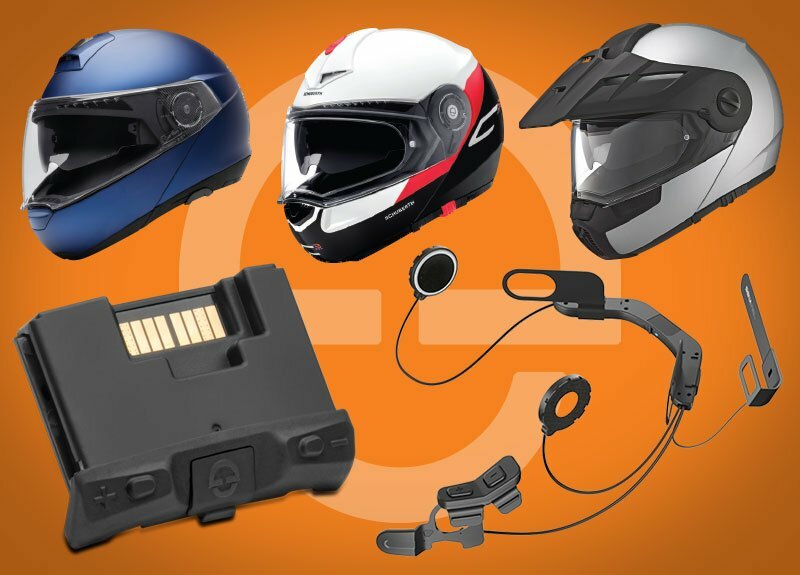 cheap if you bought your Schuberth helmet last week, last month, or last year. We didn’t know anything about this deal until this week. It comes from Schuberth, and there’s no room for manoeuvre. But it’s good news if you’ve been looking to buy a flip-lid with comms. You’ll save a decent chunk. No idea when the deal ends, however; it could be any time. Best not to mull it over for too long. Spidi's J&Dyneema jeans now in stock. Honestly, they are! Undoubtedly, the fault is ours, but there’s nobody out there who is more gullible than us when it comes to promises regarding delivery dates from suppliers. For several months, these jeans have been just a week away. But now, we promise you, they are here. Albeit not in huge quantities. The J&Dyneema jeans are single-layer, so they’re light and easy to wear, and flow the air much better than a Kevlar-lined jean. The official Cambridge test certificate shows them to have a slide time of 4.1 seconds; that makes them about the same as leather. Yet, of course, they much nicer and easier to wear than leather. Spidi has been making jeans forever, so they know how to make denim look good. The fit is on the slimmish side and, of course, you cannot tell them apart from a jean you might buy in a shop. The knee and hip armour comes as standard. The colour is meant to be black but, in truth, it’s a very, very dark blue. They come in a 32” leg only, so the exceptionally long-legged will not find the jeans to their liking. If you’re short-legged, we will do the alterations if you come and visit us in the shop. And we don’t charge for alterations, by the way. Our Friday round-up bulletins are normally about the latest, new products. It has to be acknowledged, therefore, that these two comms. units are not totally new; they are, however, new to us. 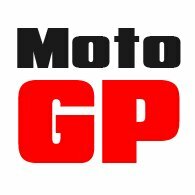 We’ve taken them on because we’ve become huge Sena fans, a reflection perhaps of our experience with their units in the Schuberth C3 Pro and the Shoei Neotec 2 helmets. 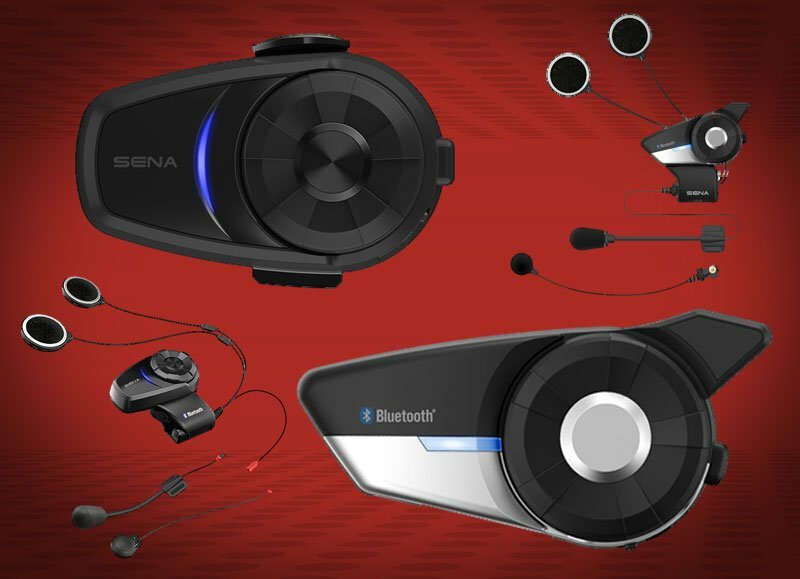 They both work superbly, and a consensus of opinion in the motorcycle world seems to suggest that Sena’s comms. are better spec’d, more reliable, and just work better than most of the other brands. We’ve decided to go with their two best packages: the 10S and 20S Evo. Their 30K is newer, and with a higher number people assume that it’s the premier model, but it is not better than the 10 and 20. In essence, the 30K is a 10S with mesh technology. Now, mesh technology allows a chain of riders to link together to increase the distance over which then can talk. But it only works if all the riders have 30Ks, so we've ignored it. Of the two models we’re doing, the 10S has a lower spec. It allows you to connect to up to four riders and has an effective talking range of 1.6km. You also get Active Noise Control, and what Sena calls ‘Universal’ compatibility with other systems (Cardo can still be problematic in our experience). The 20S has all the same functionality, but it’s good for 2km and up to eight riders. You also get FM radio, and what is known as multi-tasking. If you’re fed up with comms. systems that never seem to work, it might be time to move over to Sena. We’ve recently had in a couple of new jackets from our friends at Helstons. The Alpha is a gorgeous leather jacket that takes its cues from the jackets worn by some French police forces. The leather, as is always the case with these guys, is gorgeous. It’s treated to give it an authentic patina, but you also get an aluminium lined inner thermal jacket and a waterproof membrane. Obviously, you get CE armour in the elbows, shoulders and back. In the same delivery as the Alpha was one of the nicest mesh jackets we’ve seen. It’s called the Modelo; it’s in brown, which gives it more of a stylish feel than you normally get with a mesh jacket. Armour is standard throughout, but interestingly the Modelo also comes with a removable waterproof inner jacket. Clearly, that will be useful if it rains, but actually if you’re riding on a chilly day, a waterproof membrane will help you stay a lot warmer. All this for £169.99. A bit of a bargain in our book. Come to think of it, £399.99 for the Alpha isn’t bad value either. It was initially scheduled to arrive with us in time for last Christmas, and has been subject to numerous delays since. But the day we went to print on this catalogue, the importer assured us that our first delivery was just days away. So by the time you read this the S-Drak should be in the warehouse. The helmet is pretty funky; a re-imagining of the original Drak, with its permanent goggles and Hannibal Lecter-style face mask. The new S-Drak is much friendlier, and easier to wear. The drop-down visor is a great improvement on the goggles, and the bug protector can be affixed or removed in seconds. 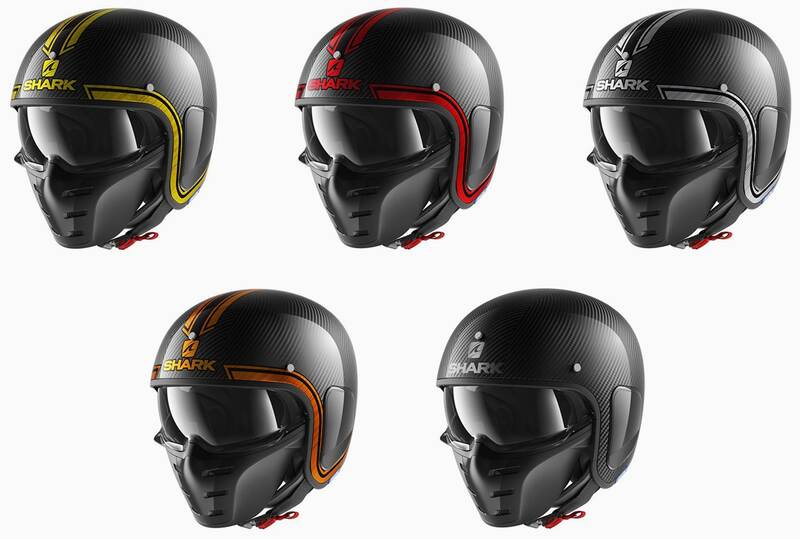 The helmet itself is made from carbon fibre, so it’s commendably light. And Shark is particularly pleased with the shape that is supposed to fit closer to the skull than other open-face helmets. We think it’s a winner. Well, it will be when it gets here. It’s priced from £299.99. We will be able to offer different thicknesses of cheekpad to get the fit right, and there will be an option to clip in a peak. But neither the pads or the peaks will be available immediately. Still a few weeks away is the other version of the helmet called the X-Drak that comes with ear panels and a peak as standard.